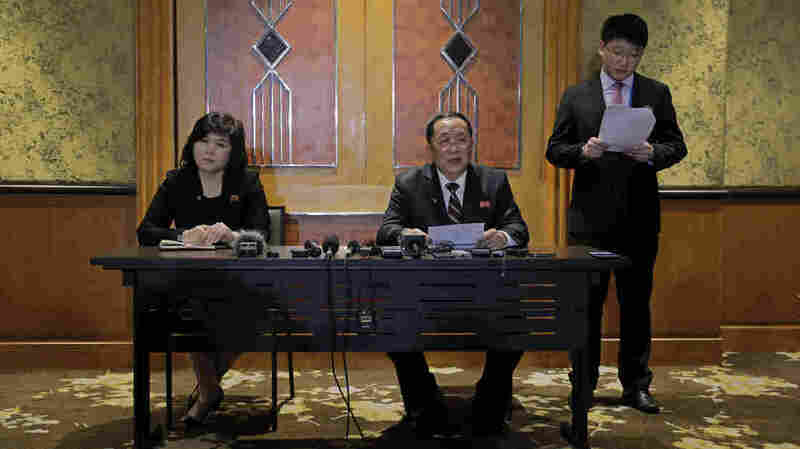 North Korea Counters Trump's Claims About No-Deal Summit North Korea's foreign minister gave an account of the country's demands for a deal that differed from Trump's account and said Pyongyang would be unwilling to change its offer. North Korean Foreign Minister Ri Yong Ho (center) addressed why talks between President Trump and North Korean leader Kim Jong Un ended with no deal, at a news conference in Hanoi, Vietnam, on Thursday. "What we proposed was not the removal of all sanctions but the partial removal," Foreign Minister Ri Yong Ho said through an interpreter in Hanoi. He said North Korea sought relief from five U.N. sanctions imposed in 2016 and 2017 that hurt the country's economy, out of a total of 11, in exchange for disabling its main nuclear complex. But earlier, Trump said at his own news conference from Hanoi that Kim, North Korea's leader, "wanted the sanctions lifted in their entirety, and we couldn't do that." Trump sought to emphasize his comity with Kim, saying that the meeting was filled with "warmth" but that he opted to leave with no deal rather than agree to a bad deal. "I could have 100 percent signed something," Trump said. "I'd much rather do it right than do it fast." He said he hopes to meet with Kim soon to try for negotiations again, although he has no current plans. Ri, however, indicated that another meeting may well be fruitless as the North will not budge. "Our proposal will never be changed." He said that in exchange for partial sanctions relief, North Korea was willing to "permanently and completely dismantle all the nuclear material production facilities in the Yongbyon area, including plutonium and uranium, in the presence of U.S. experts." In addition, Ri said the North would also put a "permanent halt" on nuclear and long-range missile testing "in order to lower the concerns of the United States." He said that given the "current level of confidence" between North Korea and the U.S., the proposal "was the biggest denuclearization measure we could take." "However, during the meeting, the United States insisted that we should take one more step besides the dismantlement of nuclear facilities in the Yongbyon area," Ri said. "Therefore, it became crystal clear that the United States was not ready to accept our proposal." Ri did not specify what that extra step was. But North Korea has long resisted giving a full accounting of its arsenal or giving total access to inspectors — moves that experts say are necessary to verify it is giving up its weapons. Trump said at the news conference in Hanoi that the U.S. brought up other threats it knows about during negotiations, saying, "I think they were surprised we knew." Secretary of State Mike Pompeo added that even if Yongbyon is disabled, it "still leaves missiles, still leaves warheads and weapons systems, so there's a lot of other elements that we just couldn't get to." "They have to give up more," Trump said. The president made a pit stop Thursday at Alaska's Joint Base Elmendorf-Richardson to refuel on his way back to Washington, D.C. And while he did not directly address Ri's remarks in his address to troops there, White House press secretary Sarah Sanders said he was aware of them. But after Trump left his second summit with Kim, with North Korea no closer to denuclearizing, the U.S. president sought to underscore American military might in his remarks to the troops. "America does not seek conflict, but if we are forced to defend ourselves, we will fight and we will win in an overwhelming fashion." NPR's Anthony Kuhn contributed to this report from Hanoi, Vietnam.